NEES-2 held its Spring Accomplishment Meeting May 22-23, 2018 in Albuquerque, NM, on the campus of the Center for Integrated Nanotechnologies, a part of Sandia National Laboratories. 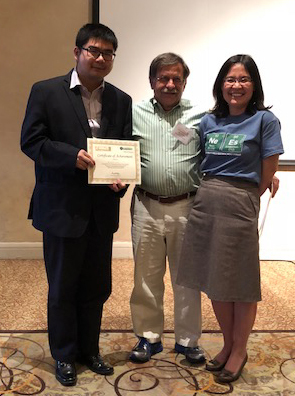 The meeting was the 2018 spring gathering of the recipients of the Energy Frontier Research Center, Nanostructures for Electrical Energy Storage (EFRC NEES) supported by the US Department of Energy. The project was headquartered at the University of Maryland at College Park under the leadership of director Dr. Gary Rubloff, and involved over 20 principal investigators from universities and national laboratories, as well as their research associates and students. 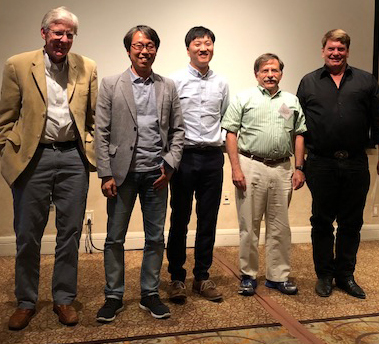 NEES PI Dr. Katherine Jungjohann chaired the special session “CINT Scientists Round Table Presentation“ that featured CINT scientists who explained current projects and capabilities in order to encourage collaboration between NEES PIs and CINT. At the meeting, the group held a poster contest in which students and research associates presented their most recent results and updates on research threads emerging from NEES-2. In all, 29 posters were submitted, and three winners chosen. The poster award categories were: Team Science, in which expertise and effort were spread across the various teams and thrusts of the NEES project; Presentation, where both visual and verbal style were assessed; and Innovation, which valued novelty of approach. The judges were: Steve Harris, Lawrence Berkeley National Laboratory, advisory board member; Eleanor Gillette, NEES alumnus now an assistant professor at the Department of Chemistry and Biochemistry, San Diego State University; and Parag Banerjee, NEES alumnus, now an associate professor at Department of Materials Science and Engineering, University of Central Florida. Sylvia Li (not pictured) was a graduate student of Mark Reed who recently received her Ph.D. degree. L-R: Henry White (Utah); Sang Bok Lee (UMD); Nam Kim (UMD); Gary Rubloff (Director, UMD); Mark Reed (Yale). 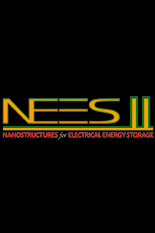 Nanostructures for Electrical Energy Storage (EFRC-NEES) focuses on nanostructured architectures exploiting high surface area for short ion transport time, inevitably engaging a highly confined electrolyte environment that we study using a novel nanofluidic cell. These nanofluidic cells are microfabricated, achieving well-defined geometries at different length scales and minimizing averaging effects. Utilizing atomic layer deposition (ALD) to deposit battery storage materials3-4, the nanofluidic cells can serve as a general platform with highly controllable architectural design to unravel the coupling of different phenomena in complex EES systems. Here we present results on a model system with TiO2 electrodes for lithium storage (Fig. 1a). Representative cyclic voltammetry (CV) graphs in Fig. 1b compare nanoconfined performance with the bulk counterpart, revealing intriguing phenomenon of an enhancement of peak current and an increase of specific capacity. Such enhancement can be explained by ion redistribution under confinement, which is shown in simulation results (Fig. 2). 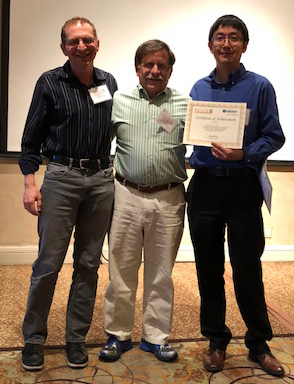 YuXiao Lin (MSU); Gary Rubloff (Director, UMD); Yue Qi (MSU). Li-S batteries have been actively pursued as one of the next generation energy storage devices. Interestingly, most of the discharging open circuit voltage (OCV) curves for Li-S batteries show either one plateau or two plateaus. Understanding the mechanism and condition of the one-plateaued discharging OCV can provide guidelines for Li/S battery design in order to improve its cycle life by preventing the Li-polysulfide (Li-PS) dissolution. However, a consistent model that clarifies the difference between the two types of OCV curves is still missing. In this article, we first devised a method based on density functional theory (DFT) calculations to predict the temperature and solvent dependent OCV when both crystals (S, Li2S, Li) and dissolved molecules (Li-PS, such as Li2S4) are involved in the discharging reaction. We successfully predicted the two-plateaued OCV with fully solvated Li-PS and the one-plateaued OCV with non-solvated Li-PS, in agreement with experimental observation in typical Li-S batteries with liquid or solid electrolytes. Furthermore, if Li-PS is only partially solvated, its formation energy increases, leading to a transition from the two-plateaued to the one-plateaued OCV, as the Li-PS changes from fully solvation to partial or no-solvated state. Therefore, a new Li-PS dissolution mitigation strategy is proposed, as the partial solvation can be created with a highly-concentrated electrolyte or by varying pore size in the carbon matrix to confine S and limit the number of solvents transported into the pores. A. Alec Talin (Sandia-CA); Gary Rubloff (Director, UMD); YiYang Li (Sandia-CA). Electrochemical ion insertion enables dynamic modulation of materials chemistry, composition, and properties using current and voltage. The host material is a mixed conductor where both electrons and ions are mobile, and can accommodate different guest stoichiometries. The guests act as electrochemically-controlled, reversible dopants. When the electronic pathway is eliminated, the guests remain in the host for non-volatile operation. This mechanism is widely used for energy storage in Li-ion batteries, and has promising applications in novel electronic and optical devices.